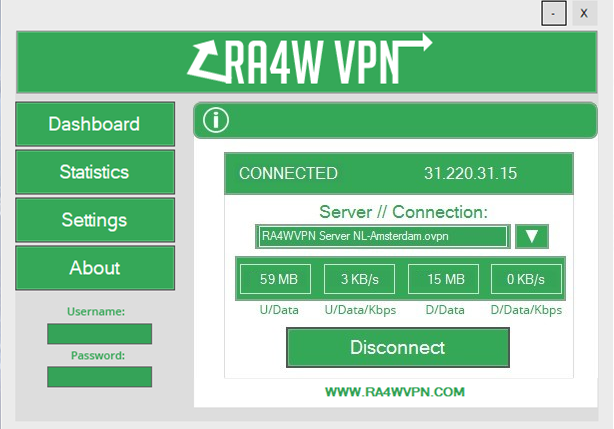 RA4W VPN Review January 2019 – Is the VPN Legit? RA4W VPN Review 2019 – Is the VPN Legit? While this VPN is a definitely a credible provider that users can trust on, the best part about it has got to be its rock bottom prices. The monthly plan’s pricing might be something that can be matched by other VPNs, but few can match RA4W VPN in the quarterly and yearly pricing plans. At just under $8, you can get a secure VPN subscription for a full three months! This makes it around $2.66/month, which is just incredible, but wait, there’s more. The Yearly plan is offered at just $15.99 billed once making it cost a miserly $1.33/month if it subscribes to this plan! 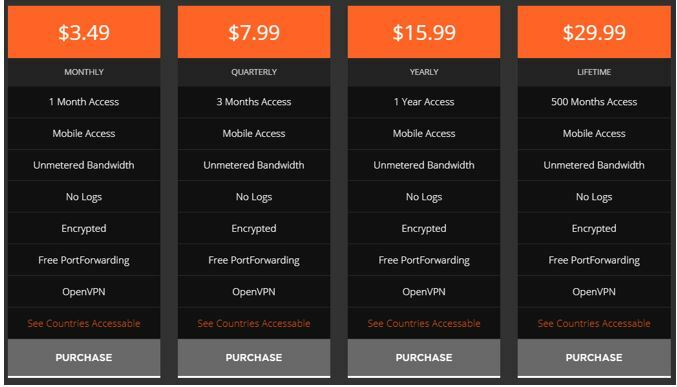 This is just great for all those VPN users that want to subscribe to a good enough service at low prices. Not many providers offer their plan for anywhere close to $1.5/month, so this plan at RA4W is a deal breaker definitely! Have you ever come across any such deal where a VPN is offering lifetime subscription for just $30? No right? And you will not come across it any sooner except for RA4W’s lifetime subscription! For just $29.99 billed once, you can get this provider’s lifetime subscription which contains multiple server access, unlimited bandwidth, port forwarding and other awesome features. And apart from all of this, RA4W is about to offer its own iOS client very soon so this is definitely one provider that you can check out, because the money you will be putting at stake here is just next to nothing for such great deals! Our RA4W review indicates that signing up with the service is easy. Simply visit the register page. Enter a username, email address, and password. If you have a license code, make sure to type it. Move on with the process by agreeing to the Terms of Service and clicking on the “register” tab. The site will redirect you to a page showing the below message. Upon receiving the email, click on the validation link. This will complete the sign up process and create your account. To start using the service, click on the “Purchase” tab from the dashboard. Choose a plan that best suits your needs and budget requirements. Hit the purchase button and you will see “Payment Settings”. Select your payment type, complete the checkout process, and enjoy using RA4W! You can even purchase an unlimited ports add-on, which is an extra $5.00. 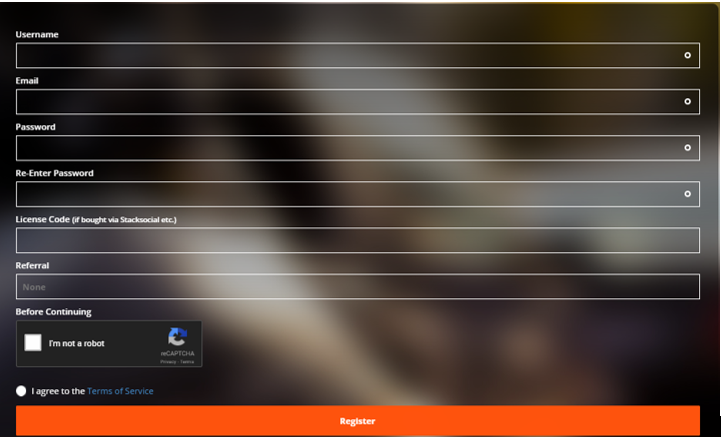 After creating an account, you will get a “dashboard” for your profile, above the RA4W website page. On the main tab, you will find information about your username, data for connection (login and password), plan selection, expiry date, and current IP address. Next is the “purchase” tab, where you can easily renew your VPN subscription, in case your package expires. After that, you will see the “Ports” tab, which enables you to configure Port Forwarding on servers. For downloading the Windows client or OpenVPN configuration files, click on “Download”. The “Notifications” tab is empty. There was no welcome message. No alerts about working/non-working servers. It seems to be still in development process. In the future, you may receive all kinds of notifications though. If you go next to your username, you will see options like edit profile, referrals, invoices account settings, and logout tabs. Settings in this user control panel are scanty. Some options are still in completion process. For instance, if you click on the “Edit Profile” tab, you will receive a message telling you “This feature is not yet functional, and will be completed soon”. If you want to change your email and password, you will find the main settings on the “Edit Account Information” tab. Although the notifications bar does not work, you have options of enabling/disabling security and system emails. Unfortunately, RA4W VPN does not offer a money back guarantee or refund of any kind. However, according to our RA4W review, it is quite understandable. The vendor does offer amazingly cheap pricing for its premium plan. For a low $2.99 per month, you can gain access to servers in 25 countries. Our RA4W review unveils that the provider offers servers in five continents. There 30+ servers in more than 25 countries, among which include the United States, United Kingdom, Ukraine, Switzerland, Singapore, Netherlands, Moldova, Germany, France, and many others you can check out here. Upon purchase of a plan, you gain access to all these servers with the capability of connection to them, as many times you want. The provider does not throttle bandwidth or impose data limits. Periodically, RA4W VPN adds new server locations to encourage more users from across the world. Listed on the home page under the name of each server, you can see its real time status. However, many users have reported experiencing connectivity issues with some servers. As a USA-based VPN provider, RA4W VPN is subject to following certain data retention laws. However, there was no mention on the site regarding logging any sort of information. This means, you can leverage good anonymity over the internet. Problems start arising though when you look at the outdated 128-bit encryption ciphers used by the service. 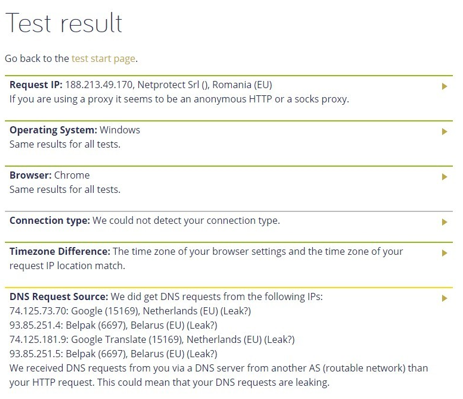 The application also failed to pass the DNS leak test we performed. Although its SSL certificates are good, our RA4W review exposed the site housing numerous trackers too. Therefore, it is safe to say that the provider offers a very basic level of protection. While you can easily gain access to geo-restricted and blocked sites, the privacy you receive will be meager. This means, if things go south, your IP address is traceable back to you. Nobody would want to take such a risk! Our RA4W VPN discovers that all servers only support the OpenVPN protocol. You can create connections only on TCP 443 and UDP 1194. Although these protocols offer good security, relying on them entirely would be foolish. The best VPN providers always make sure to add L2TP, PPTP, IPSec, IKEv1 and IKEv2 protocols with high level AES-256 ciphers. All servers of RA4W use the Blowfish 128-CBC cipher encryption with SHA1 authentication and 2048-bit RSA key. This level of encryption is sufficient, but not the strongest. The outdated SHA1 hash is risky, as it is provable that this algorithm can be hacked easily. We would definitely like seeing an improvement in protocols, along with higher-level of encryption. According to our RA4W review, the provider allows P2P/Torrenting on all its servers, except for those in the US. All locations in the country are restricted from downloading via Torrents. Nevertheless, you can connect to other locations to access blocked torrent sites by your ISP, bypass internet censorship, and geo-restricted websites like HBO, Netflix, BBC iPlayer, Hulu, Spotify, etc. How safe is RA4W VPN? In terms of logging, it is a no brainer that recording session/connection data is not healthy for VPN users. Yet, many top-tier services store this information, reducing their credibility. RA4W states on its website that it boasts a strict zero logs policy. They say no session/connection data is stored within the service, but they do record other information. For granting private internet access, sending payment confirmations, subscription information and promotional offers, the site logs email addresses. For managing cancellations, invoices, and handling client signups, payment data is stored. However, this alone is not enough to guarantee the safety of the provider. During our RA4W review, we came across some conflicting statements on Reddit. Some users have exposed the service for logging session/connection data, along with other metrics. You can read more about this in the RA4W VPN Reddit Impressions section. While performing our RA4W review, we evaluated the VPN’s anonymity by performing a DNS leak test. We randomly selected the ‘Belarus’ server for testing. If you happen to see the flag of Belarus anywhere, it means the service does not pass the leak test. This plugin blocks all IPv4 and IPv6 DNS queries, except on OpenVPN’s TAP interface. It acts like a temporary firewall, blocking all leaks and clearing its rules upon crash or termination for protecting your IP and connectivity information. Not only does this increase protection, but it also makes it difficult for ISPs to monitor internet activity and individuals to hack/unlock your connection. Every website that accepts credit card information, usernames and passwords and stores it in a database for later processing must have a powerful SSL certificate. When installed, it activates the https protocol and padlock for secure connections. During our RA4W review, we performed a SSL certificate test. As you can see, RA4W uses certificate grade A+. This means, the security on the website is not bad at all, even though its VPN service definitely requires an upgrade. You can feel assured your sensitive personal information is safe and sound on the website. Things get even more frustrating, as many internet users do not know that websites steal valuable activity information. This is no different from being watched/stalked in the real world. 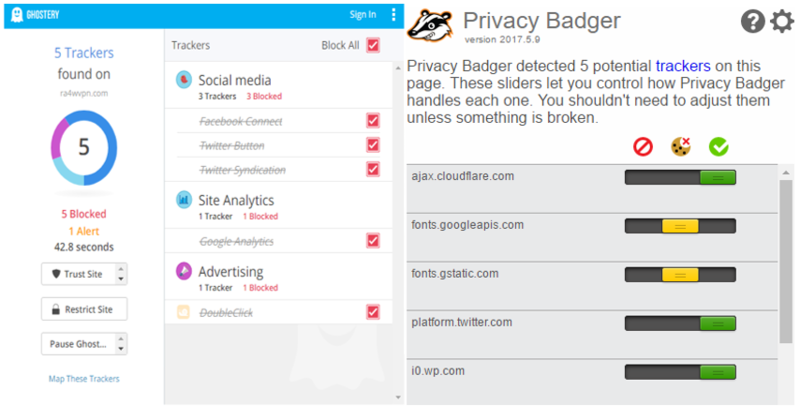 To get a better idea on the VPN for our RA4W review; we decided to conduct a Tracker Test.As you can see, both Privacy Badger and Ghostery detected five trackers on the RA4W website. This poses great risks to anyone using the website. All your information logs within seconds, unless of course you use a blocker software. According to our RA4W review, the VPN provider does not have a very active or cooperative support team. 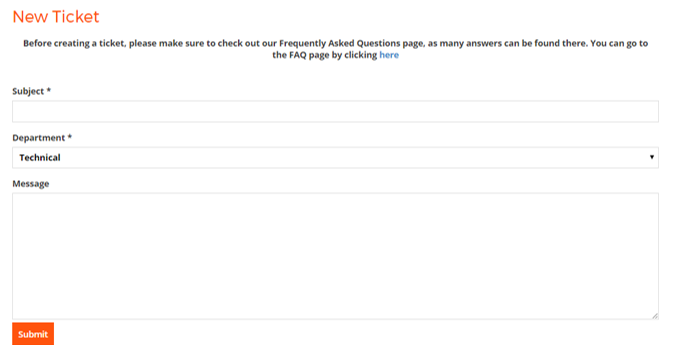 Judging by the FAQs page, it may take an entire day for you to get a reply. Most of the times, the responses do not prove much helpful. Information on the site itself is quite scarce. There is a Ticket system used for providing support. You can send emails to contact@ra4wvpn.com and RA4W has a page on Facebook to offer assistance. However, there is no live chat available. Users also do not have access to setup guides. In short, the support is almost close to being nonexistent. Our RA4W review discloses that the VPN provider only offers a single application that is available to Windows users only. There are no custom apps for Mac, Android, iOS, or Linux. In order to use the VPN, you will have to install OpenVPN GUI. This software makes it possible for RA4W users to add configuration files, enter their credentials, and connect to the VPNs servers. According to our RA4W review, the Windows Client looks utterly cluttered and boasts almost no settings. You cannot switch from UDP to TCP. There is no way for you to configure connections. It might just be better to use OpenVPN, instead of opting for the Windows Client.Upon launching the app, you will notice the main tab showing your current IP address. To connect to a server, select any location of your choice, and click on the “connect” button. You will now be able to see connection statistics, which include upload data and download data. If you click on the “statistics” tab, you will receive real-time updates regarding your connection in the form of a connection logs and a graph. You can use this information to judge the consistency and performance for different servers.Upon clicking on the “settings” tab, our RA4W review found that configuration options are completely missing. You can only delete, verify, update or create the TAP adapter. Switching to a different protocol is not possible and the configuration manager is useless. Our RA4W VPN finds that the service is compatible with Mac. Instead of using OpenVPN software though, we recommend using Tunnelblick. It is a free, open-source software, which works perfectly for creating custom VPN connections on Mac. Upon downloading and installing the application, you just need to add the OpenVPN configuration files from RA4W VPN for connecting to different servers. The process for using RA4W VPN on iOS is quite similar to Android. You just need to download and install the OpenVPN Client from the Apple Store. Download the configuration files from RA4W VPN, import them in the VPN software, select any server of your choice, and enter username and password. You will notice a green check mark upon successfully establishing VPN connection. Our RA4W review unveils that you can only gain access to the download center, upon creating an account with the service (regardless of whether you pay for a plan). Once registered, simply click on the “download” tab on the user dashboard. You will get two options. Download “VPN Client for Windows” or “OpenVPN Configuration files”. Once you have downloaded the application, you need to unpack the zip file. Since the VPN client is portable, it requires no installation. Upon downloading the configuration files and extracting the zip file, you will see two folders. One with VPN settings for TCP protocol and the second for UDP protocol. 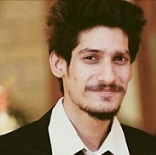 TCP uses port 441 for restricted networks and UDP uses port 1194. How Many Devices Can You Use RA4W VPN On Simultaneously? According to our RA4W review, you can use the VPN on as many devices as you like. However, please note that it is important to use different servers for each device. This means, if you connect to Server X from your computer, you must avoid using the same server for your mobile. Sometimes users do leave you flabbergasted because they can post their own opinions which can mightily differ from your own. The same thing happened with us when checking for user opinions on Reddit for RA4W VPN. There were multiple threads on this platform according to our research that had many users commenting that RA4W was found to keep user activity logs and it also accused this provider of being an unsafe service! Most of these conversations were centred around a paste bin link that has since been removed but when it was live, it contained a detailed description of how a user found out that RA4W VPN kept logs. After this many users came forward with their own experiences where they commented on how they found the service not to be good. But these posts are quite old, at least a year, so we hope that RA4W did upgrade its service and solved most of the problems that users experienced with this service at that time. Our RA4W review establishes that the provider is only suitable for those individuals who need a budget VPN at their disposal and will not be bothered by inconsistent connection speeds. The low pricing is definitely an attractive trait. However, the service fails to compete with other VPNs in the marketplace. With its limited selection of protocols, lack of encryption choices, average customer support, and DNS leaks, it is highly unlikely you will receive top security and anonymity. Combine these flaws with the Reddit impressions; you may want to think twice before subscribing to the VPN. 10 Responses to RA4W VPN Review 2019 – Is the VPN Legit? Thanks for commenting here Terry. I feel bad that you had to fall victim to the service. There’s a reason why we gave the provider only ONE star. It is not trustworthy at all. Worst part is, you cannot even ask for a Refund. Since they don’t have a policy for it. Make sure to always research providers,before signing up with them. Reading reviews always gives a good idea about different services. 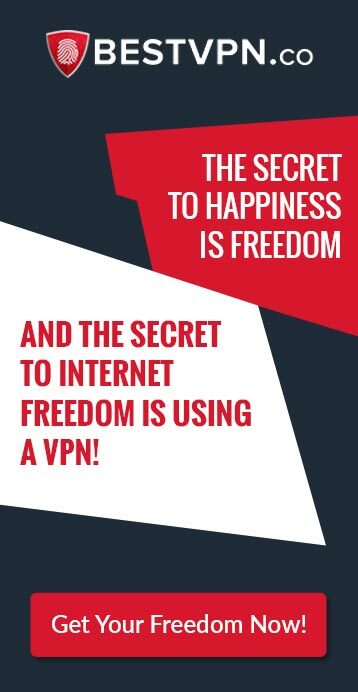 I’d recommend you waste no time, and opt to use ExpressVPN or NordVPN. They might be a little expensive, but are worth the money (at least for now). Without logging how would they know you were participating in any of these activities? Thanks for pointing that out Martin. Like we mentioned above, the services STATES it does not log, but it seems like the truth is different with many Reddit users even presenting proof (link above). It’s like every provider is JUST HUNGRY FOR INFORMATION! Considering the price i’m happy, it’s not fair comparing them to VPN’s such as PIA or similar since they obviously are not in the same price range at all. It meets my needs and does it very well. Avoid them at all costs!! Nothing works – and when I tried to get a refund via paypal they said they were experiencing technical difficulty blah blah… honestly they are useless! Hi Tam Lee, thanks for sharing your experience. However, the company is actually not being dishonest. The VPN provider makes no claims of offering a money back guarantee. Could you share a screenshot of their reply to you? Hi Brandon, you will find the configuration files on the main RA4W website. Log in to your account to gain access to the dashboard. However, you must just find better reliability and security with other services like PureVPN and ExpressVPN, which do not suffer with any DNS or IPv6 leaks. this is an ok vpn and the price was right.